updating cows instead of facilities? Unfortunately, correcting deficiencies in stall design can be costly and may still result in a compromised facility. For example, because the footprint of a facility is fixed if one wanted to widen stalls the only option would be to decrease the overall number of stalls. Moreover renovating stalls to be wider often results in obstructions in the front of the stall because many stall dividers provide structural support and cannot be removed. This restricts lunge space limiting stall use. Conversely, if stalls need to be longer space must be taken from the alley which can create problems with equipment or the movement of animals. Both scenarios can be frustrating, especially when you consider the investment required. Despite these setbacks there are solutions that can improve cow comfort in older facilities; you just have to think outside the box. Consider this: many stalls are inadequate because cows have progressively gotten bigger with improved genetics. This larger Holstein has become unsuitable for the traditional sized stall. Habitually, one considers ways to change the stall however it may be worth considering a change in breed. 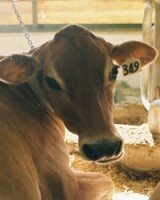 Because stall dimensions are based on cow size, the smaller stature of a Jersey cow makes them more suitable for a traditional sized stall. Using a smaller animal instead of a larger stall allows producers to maintain the current number of stalls and improve cow comfort. In addition, Jersey cows also have other desirable traits including increased resilience to lameness, higher percent components, improved reproduction, and improved feed conversion efficiency. In the northeast we continue to struggle with lameness, most likely due to a wetter climate and facilities that lack in cow comfort. In comparing the larger Holstein cow (average mature bodyweight, 1,500 lbs.) to the smaller Jersey cow (average mature bodyweight, 1,000 lbs. ), the lighter Jersey results in less weight per square inch of hoof. This provides additional resilience to lameness. Moreover, Jerseys produce less milk by volume, however Jersey milk contains substantially higher milk fat and protein. Because producers are paid off of components the higher percent fat and protein would offset some of the lost milk production and this does not account for any gains in milk production due to improved cow comfort. Finally, the lower total body mass of the Jersey system reduces maintenance costs per animal, meaning proportionally more nutrients are being devoted to milk production instead of homeostasis. The greater nutrient density of Jersey milk further dilutes maintenance requirements, leading to greater production efficiency. Other ways to achieve these benefits could be cross breeding Jerseys with Holsteins, which may provide an additional boost from hybrid vigor. Ultimately, keeping an open mind to all options when it comes to cow comfort may breathe new life into outdated facilities.